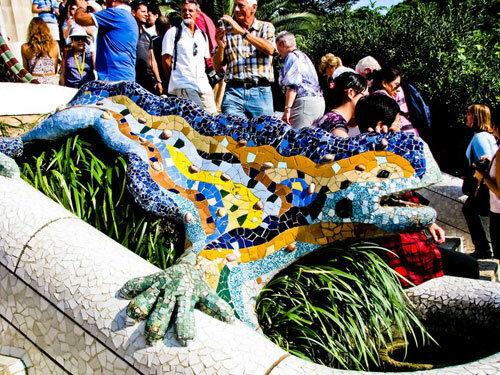 Gaudi Shakes Up the World of Architecture & Mosaic! Home / Blog / Gaudi Shakes Up the World of Architecture & Mosaic! Antoni Gaudi’s work is known to be one of the most unique architectural styles in the world, and one of the most important in Barcelona. His designs were greatly influenced by nature, whether in the curves and forms of his structures, or the colours he added to them. A review of Gaudi’s work, from La Sagrada Familia to Park Guell and Casa Batllo, highlights an interesting combination of original designs and vibrant colours, which are traits of Gaudi’s breathtaking architecture. 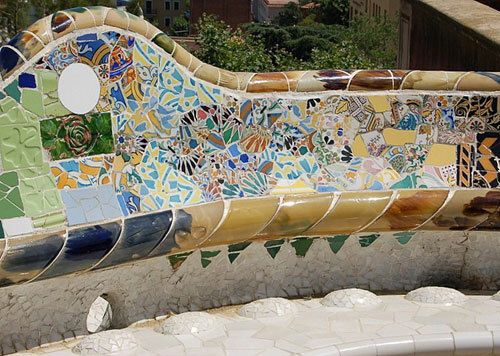 In fact, coloured tiles arranged in mosaic patterns are an important feature in Gaudi’s work, especially in Park Guell, where a mosaic dragonadorned in beautiful coloured tiling welcomes you at the entrance, and multi-coloured tiled mosaic structures await you inside.